It pays to advertise in the U-Times. University City High School students spend a great deal of money on clothing, food, electronic gadgets, and entertainment. In addition to spending their own money, they also have a lot of influence on the money their parents spend on their behalf. They are also regular readers of the U-Times, which they receive at no cost. Target the teen market here, at rates that are hard to pass up. 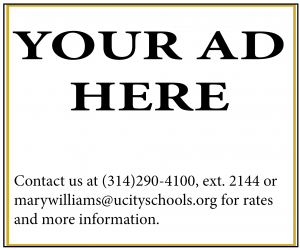 Also, copies of the U-Times are distributed throughout the community at no charge.